While working on her bachelor’s degree, which took her only three years to complete, Kelsey Sigman was heavily involved in leadership roles at UT Martin. She gave campus tours as a student ambassador and participated in the Leaders-in-Residence program, a scholarship program that helps students enhance their leadership abilities. But after graduating and working for a software company in Nashville she began to reevaluate her future. For several years, Sigman has helped with sports clinics on mission trips in Nicaragua, Mexico, the Ukraine and some inner cities in the U.S., and it was through these trips that Sigman recognized her true passion, which she plans to turn into a career. As Sigman began considering new avenues, she rediscovered UT Martin and decided to return to her alma mater to pursue her master’s of education and obtain her initial licensure with an emphasis in health in human performance. "The cool thing about [UT Martin] is that in HHP and in the education department, you can organize your classes in the way you want. One of the professors in the department and I had been talking about my own interests and what I like to do, and I mentioned the Nicaragua trips, the sports clinics. He said, 'That's awesome. We can make this class where you design a curriculum for international sports clinics.’ … specifically, for third world countries like Nicaragua,” Sigman said. 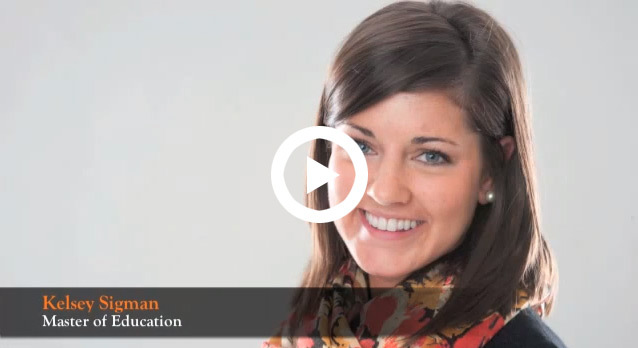 Sigman chose to take the education route in addition to studying health and human performance because she believes she can have a positive impact on a great number of people, and her experiences with the health and human performance program are reflective of UT Martin's objective of putting students first. She was asked by Dr. Laura Brown, professor of health and human performance, to lead in a presentation in March 2012 at the American Alliance for Health, Physical Education, Recreation, and Dance national conference in Boston to discuss the use of pedometers. "I love the professors, the faculty and staff here. They genuinely care about you, not just as a student but as a person. So, you build close relationships with your professors. I presented this semester with a professor in the HHP department at a national conference. If we hadn't built that relationship, that wouldn't have happened,” Sigman said. "She went above and beyond and let me be a lead presenter. Most schools require their graduate students to do research and they get their name in fine print in the back of a book if it gets published. So, to present at a national conference is huge. That's huge for my resume. And as a lead presenter, that's awesome that she let me do that. That just shows you the commitment to seeing their students succeed." While working on her graduate degree, Sigman remained involved on campus, teaching fitness classes at the Student Recreation Center and working as a graduate assistant in the Department of Health and Human Performance. 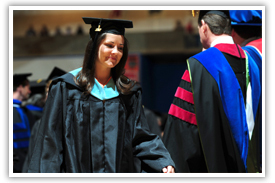 In May 2012, she received her master’s degree, which she hopes will help her advance her mission work in the U.S. and abroad.